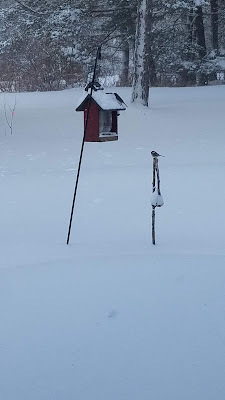 You may have noticed that each of the two longer stanzas of this poem describes a the same location in a different season - the sunflower and feeder in fall and also in winter. This is really a two-part poem...and that last line? Well, that's a just a fun surprise. You might try this too. Think of a place in two ways - before and after an event, in two different seasons, or even as seen by two different people or animals. Then, write one stanza from the one time or viewpoint and one from the other time or viewpoint. And if you wish to throw in a surprise, well, you're the poet. 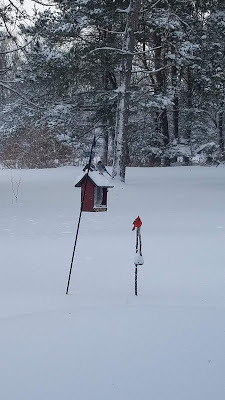 SUNDAY JANUARY 27, 2019 UPDATE: Yesterday, Mark decided to bring our old Christmas tree out for the birds...so now there are perches for all! Here you see a chickadee atop the tree (just like an angel!) and a blue jay flying in from atop the sunflower stalk. Tara is hosting today's Poetry Friday roundup at Going to Walden, with a poem by Linda Pastan. Please know that the Poetry Friday community shares poems and poemlove each Friday, and everyone is invited to visit, comment, and post. And if you have a blog, we welcome you to link right in with us. Those birds love that dead sunflower stalk! The cardinal really stands out against the white background. Thanks for the lovely poem and pics! I find it quite serendipitous that you captured three birds perched on the sunflower! I also love the contrast of the cardinal against the snow. I also like the idea of looking at a place from two different time periods. Think I may need to try this! 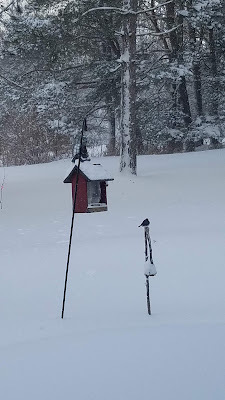 We both share pieces involving nature and snow this week. Nature does yeah us and now I wish I had a sunflower to help my now birds. You can bet I'm planting some next summer. The birds are quite happy that you weren't neater. Thank you, they say! I love how nature works and how poets notice. The perfect perch for a parade of birds! Love the photos and enjoyed the two-part poem. Thanks! What lovely winter gifts, your photos and poem. Love it, Amy! Love this poem! I feel like a bird waiting for spring, too, but I'm not super patient. I keep telling my husband there's a reason to wait for spring to clean up the garden! 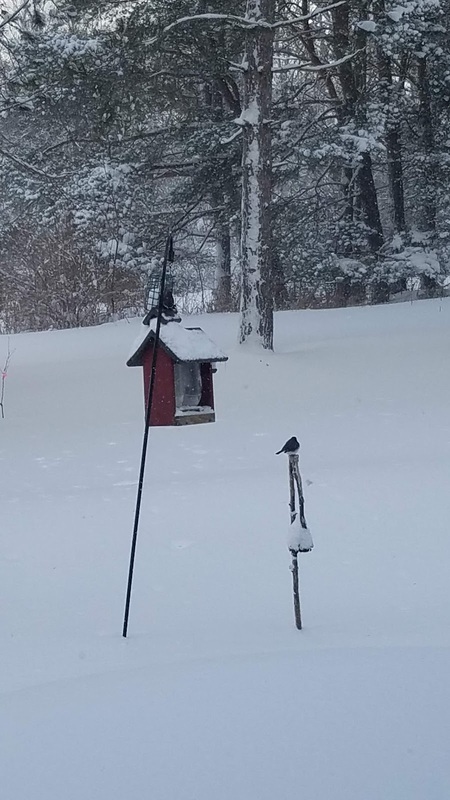 Those are some lucky birds to have landed in your yard, and we are lucky readers to share your poem. It's much more inviting for all different critters to have the remains of our summer gardens–glad you left that sunflower too. Lovely poem and pics, thanks Amy! 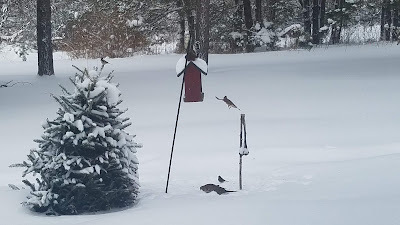 Our birds are all taking shelter in the spruce tree in the front yard and ignoring the sunflower outside the kitchen window--it's too windy there! I'm glad you have winter visitors, too!